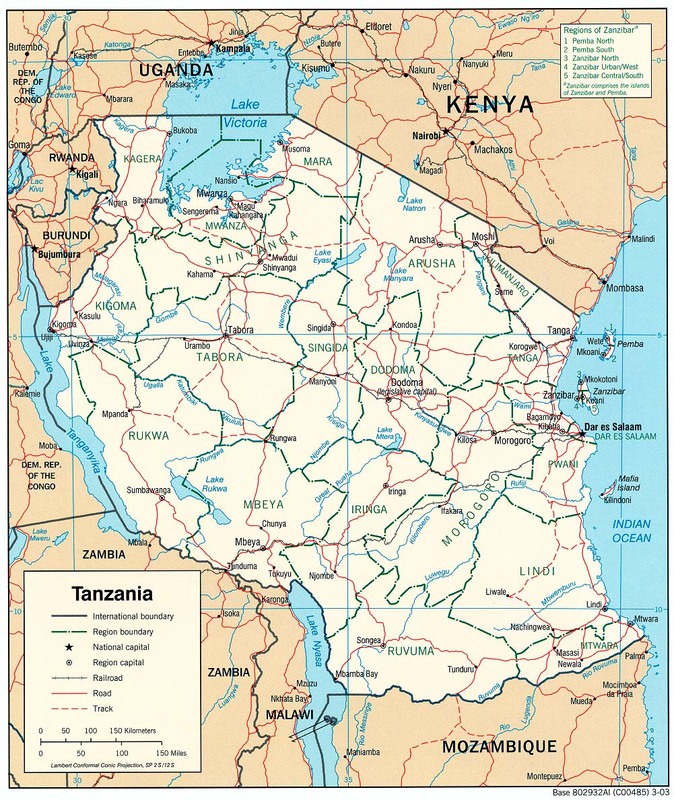 GOVERNMENT: Tanganyika gained independence from UN trusteeship administered by Britain in 1961; Zanzibar became independent from Britain in 1963; Tanganyika and Zanzibar united under the name United Republic of Tanzania in 1964. Republic with president elected by universal suffrage. Zanzibar elects own president for domestic matters. Governing body: 274-seat Bunge (National Assembly). The East African country of Tanzania was once one of the most prosperous places on the continent. For centuries, merchants traveled from Arabia and India to trade with the residents of towns along Tanzania’s Indian Ocean coast. Today, however, the nation struggles because years of colonial neglect and socialist reforms have made it one of the poorest and most debt-ridden countries in Africa. Tanzania borders the Indian Ocean just below the equator. A narrow, fertile plain runs along its 500-mile coastline. From there the land gradually rises to a central plateau. A range of medium-size mountains extends through central Tanzania. Another, much higher, chain of mountains forms the country’s western border with ZAMBIA, MALAWI, and CONGO (KINSHASA). Between the two mountain ranges lies the Rift Valley, which divides Tanzania roughly in half. At the northern end of the valley is a series of high peaks, including Mount Kilimanjaro, Africa’s highest mountain. Tanzania contains more surface water than any other African nation. Lake Victoria, Africa’s largest lake, is located in the northwest, and Lakes Nyasa and Tanganyika lie along the western border. In addition, Tanzania has a number of smaller lakes and major rivers. The nation’s climate varies considerably from one region to another. The coastal plain and the northern inland areas receive ample rainfall, and most of the country’s agriculture takes place in these regions. The central plateau is hotter and drier, and the mountainous uplands are cooler with heavy rainfall. Evidence of coastal trading settlements in Tanzania dates to the A.D. 700s and possibly earlier. About this time traders from Arabia arrived and mixed with the indigenous African population. Over the next several hundred years they formed a unique SWAHILI society. Their trading settlements flourished until shortly before the arrival of Portuguese traders in the 1500s. European colonization of the region began with its occupation by the Germans in 1884. They created the colony of German East Africa, which included Tanganyika (now part of Tanzania), RWANDA, BURUNDI, and ZANZIBAR. After Germany’s defeat in WORLD WAR I, the League of Nations assigned Britain to administer Tanganyika. The British focused on exploiting Tanganyika’s natural resources. They established mines and raised crops for export, such as coffee, tea, sisal, cotton, tobacco, and cashews. These are still the country’s main agricultural products. The British appointed indigenous rulers as government agents to recruit labor, collect taxes, and monitor crop production. This association with colonial officials undermined the authority of the indigenous rulers. When a movement for independence emerged in the 1950s, conflicts developed between these traditional rulers and members of nationalist groups, who saw them as allies of the British. In 1961 Tanganyika won its independence and Julius NYERERE, head of the Tanganyika African National Union (TANU), became the country’s first president. Once in power, Nyerere moved to ensure that TANU would dominate the political and social life of the country. He banned opposition parties and placed the trade unions under TANU control. In 1965 a new constitution made the country a single-party state. On the nearby island of Zanzibar, Nyerere’s political allies staged a coup, overthrowing the elected government in 1964. At their request, Tanganyika and Zanzibar were joined to form the United Republic of Tanzania the following year. Nyerere launched a series of socialist reforms that involved state control of industries and reorganizing agricultural production. In 1967 he announced the Arusha Declaration, a program designed to move rural people to planned villages to increase crop production and improve delivery of public services. Specifically, the plan was supposed to create communities that worked closely together, which in turn would encourage more advanced production methods, promote group production of crops, and provide more efficient access to education, health services, and drinking water. Instead, the plan turned out to be a disaster. People were forced to abandon their farms and relocate. Within a few years agricultural production dropped dramatically, forcing Tanzania to import large quantities of food. The country fell deeply into debt. In the early 1980s, in return for assistance from the World Bank and the International Monetary Fund, Tanzania agreed to sell its state industries, reduce the size of the government, and lift restrictions on imports and foreign investment. However, this program failed to stabilize the economy. In 1985 Nyerere resigned his presidency, and Ali Hassan Mwinyi took over. Mwinyi, too, was unable to turn the economy around. As the situation worsened, people began to press for political change. In 1991 Tanzania passed the Political Parties Act, allowing multiparty elections. Four years later Ben Mkapa of the Chama Cha Mapinduzi party won the presidency, but his opponents received over 40 percent of the vote. Although the nation is now a republic, the assembly and the courts are weak and the president still determines government policy. The city of Dodoma, in central Tanzania, has been selected as the site of the nation’s new capital and the government has been gradually moving there. Meanwhile, many administrative offices remain in the old capital of DAR ES SALAAM. Tanzania is one of Africa’s least developed countries. Agriculture, which employs over 90 percent of the population, dominates the economy. But in recent years declining prices and periodic droughts have severely hurt farmers’ incomes. In other areas of the economy, mining and TOURISM show some promise. Gemstone mining has grown and new gold deposits have been discovered. Tourism is rebounding after years of decline, as game reserves along the border with KENYA attract foreign visitors. However, Tanzania’s other industries remain underdeveloped, partly because of the poor condition of the nation’s infrastructure. One of Tanzania’s strengths is its social unity. Unlike many African nations, Tanzania did not adopt the official language of its European colonial rulers. Although the country has over 120 language groups, most Tanzanians speak Swahili, which is also the main language used by the media. The presence of a common language, combined with the long-term rule of a single leader (Nyerere), have helped spare Tanzania the ethnic strife that has troubled many other nations.